Bruce Cameron's books are perfect for animal lovers or people who enjoy love stories. ← The Arizona Humane Society needs your help. Now. What a perfect book for animal lovers. Especially dog lovers. And a thoughtful gift for pretty much anyone who gravitates toward love stories. Bruce is masterful at weaving four different doggy incarnations into the story of one special spark of life with a purpose. Toby, Bailey, Ellie and Buddy are the same spirit but flow thru the cycle of life with different experiences as different dogs. Reincarnation of the canine variety. Visit Bruce at www.adogspurpose.com to read about my friend from college (he was a Sigma Chi)! Bruce’s sequel to A Dog’s Purpose is A Dog’s Journey, and it is currently being made into a major motion picture! How fun is that, Bruce?! Tenderly told, both books reach deep within the heart and display the perspective of those who are misunderstood and without the ability to articulate thru human speech. Unique and precious, these reads will make you laugh and cry and open your mind to possibilities. Gift either or both books to yourself or to someone you love. 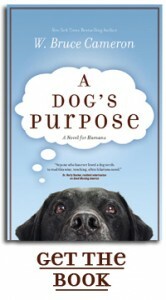 This entry was posted in Uncategorized and tagged A Dog's Journey, A Dog's Purpose, Bruce Cameron, W. Bruce Cameron. Bookmark the permalink.